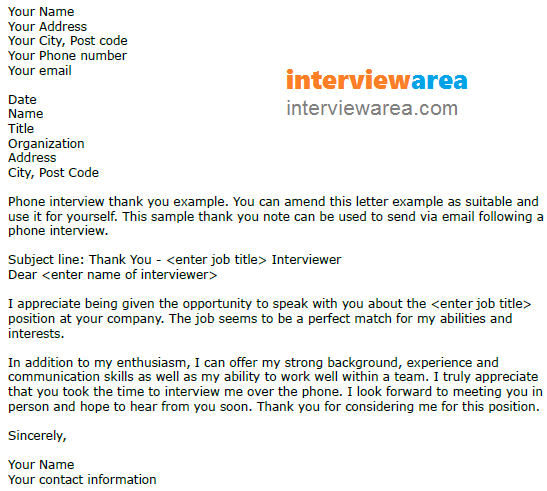 Use this letter example if you had a phone interview recently. Amend this letter as suitable before sending it to the employer. Phone interview thank you example. You can amend this letter example as suitable and use it for yourself. This sample thank you note can be used to send via email following a phone interview. I appreciate being given the opportunity to speak with you about the position at your company. The job seems to be a perfect match for my abilities and interests. In addition to my enthusiasm, I can offer my strong background, experience and communication skills as well as my ability to work well within a team. I truly appreciate that you took the time to interview me over the phone. I look forward to meeting you in person and hope to hear from you soon. Thank you for considering me for this position.